Sun and clouds, milder, a few evening showers. Highs near 60. Overnight Thursday: Breezy, showers to clearing. Lows in the 40s. Friday: Variable clouds, mild. Highs around 70, 50s north. A few raindrops overnight, mixed with snowflakes in the mountains, marked the leading edge of the warmest weather we've seen in New England in weeks. We dry out and clear up for a time today with temperatures jumping into the 50s to near 60 degrees as a breeze picks up from the southwest. Clouds race back in as another warm front comes in late in the day, with a chance of rain or showers developing west before dinner time. Rain, perhaps mixed with snow in northern Maine, will continue off and on overnight with a low temperature in the 30s and 40s. A weak cold front goes by tomorrow, but it will not make it very far, allowing the temperatures to get to near 70 degrees in parts of southern New England even as we hold in the 40s and 50s north under mostly cloudy skies. The weekend features an incredible thermal gradient over New England. 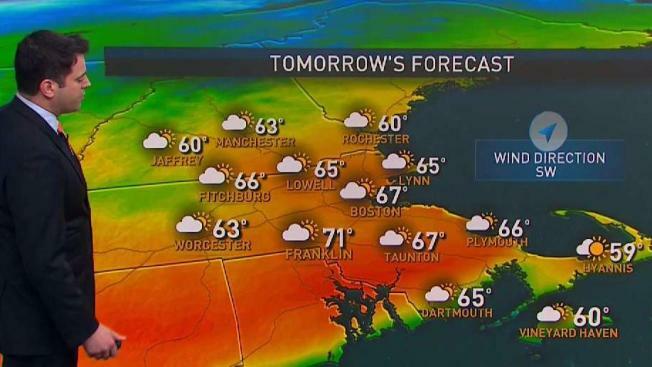 We may be close to 80 degrees in Connecticut by noon Saturday, even as the rest of New England sees the temperatures fall through the 50s into the 40s and 30s with a lot of clouds and even some light rain or snow possible north. A mighty cold, high-pressure system in southeastern Canada is going to make for chilly raw Sunday. High temperatures will reach only in the 20s north and 30s south with clouds and a chance of light freezing rain or rain, and snow and freezing rain north. There will also be patchy dense fog. For Patriots Day on Monday, the marathon might run in downpours with temperatures climbing back out of the 40s into the 50s. Wind from the south may gust past 40 mph. More seasonable air with a few mountain flurries is expected to come in for Tuesday and Wednesday with highs in southern New England in the 50s with more sunshine than clouds.